Can we finish this in 2 weeks? In the Second Age and early Third Age, the land was prosperous, filled with many woods and gardens thought it was largely abandon over time with the rise of Mordor and loss of Minas Ithil (Minas Morgul). Since then, the province has been subject to constant raids by both Orcs of Mordor and Haradrim from the South. However, scouts were kept in secret locations throughout such as Henneth Annun. The land is described as "a fair country of climbing woods and swift-falling streams," with gentle slopes "shielded from the east by Ephel Duath and yet not under the mountain shadow, protected form the north by the Emyn Muil, open to the southern airs and the moist winds from the Sea." It also included "a wealth of sweet-smelling herbs and shrubs" and a vast array of tree species, likely planted by men in earlier days. Despite the desolation, the land "kept still a disheveled dryad loveliness." Haudh in Gwanur: Tomb of Folcred and Faster, burried side by side on a single mound above the riverbank. The forces of Mordor feared to go near. There were groves of ash, bay, cedar, cypress, fir, juniper, myrtle, oak, and olive trees. The ground cover included heather, ferns, moss, and briars. Among the many flowers that bloomed in Ithilien were anemones, celandines, hyacinths, irises, lilies, and wild roses. Herbs such as marjoram, parsley, sage, and thyme grew there as well. Since the MCME map is slightly different than the drawn one, I'll chalk my question up to this being a possibility, but I thought you guys had already done South Ithilien. Or is that river that you show as the southern boundary the Poros? Well with south ithilien is meant the southern part of ithilien which is supposed to be everything beneath the road from osgiliath to minas morgul. With harithilien we mean the part that lies closer to the border with the lands of south gondor. I am not entirely sure which river represents the poros but note that we have more rivers than maps show, which means plenty of rivers don't have names. Poros is the river at the south border of Harithilien, so south border of that project here. 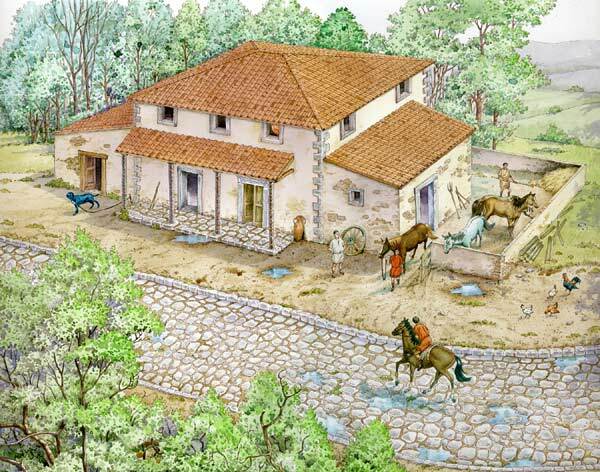 Thus it will eventually also include building the Fords of Poros. I thought I did too! what is the pink dot? Temporary warp added "/warp Harithilien Temp"
There is something on the map but unfortunately I cant actually read it..
What pink dot? you talking about pelargir? If you mean the text next to Haudh-in-Gwanûn, the lower one says Athrad Poros, which means Ford of Poros, and the upper one says Tir Ethraid, wich means Tower of the Fords. I haven't found any reference to them in the books lore, I think it's an addition of the Middle Earth Role Playing, which is where that map comes from if I'm not mistaken. I suppose the towers would be some kind of watchtowers over the fords and the road to Harad. Without a precise quote to back me up, I'd assume those are way stations. You can find similar arrangements in the Roman Empire, for example (http://www.romeinspompeii.net/mus_dis_octav.jpg). They were constructed every few dozen miles for travelers to replenish themselves and their horses. Problem is, Professor Tolkien, as far as I can recall, never describes any such arrangements on Gondorian roads. If those aren't way stations, they might simply be watchtowers set up to guard the roads of the kingdom. Rome had those along their borders in great numbers (http://upload.wikimedia.org/wikipedia/commons/c/c3/Roman.Watchtower.WP-4-49.Grueningen.01.JPG). It might also be a mixture of both, fortified stations of some sort. Sorry if that isn't particularly helpful. I tried to find lore on em earlier but couldnt so this is helpful, I will be adding watch towers then along the Eastern border against the mountains in that case with a special one close to Poros. Is the crossing a bridge or a ford? From the name, it seems it's rather a ford. These maps are designed for role-playing games and would have been made by map-makers who look at Tolkien's map and said, "How can I add a ridiculous amount of extra stuff to make this playable as a role-playing map." 1. Crossings of Poros - Complete!